A perfect Dream Fulfilled !!! On Thursday May 29th Chase Weese Met his racing hero, Jeff Gordon. Chase has a inoperable brain tumor and at almost 12 now one of his dreams was to meet Jeff . I have become close to him as well as to his family. Being that I am his Bowling hero and having the connections to make this young man smile and forget all the pain, I had the chance at the Dover Nascar race. Frank, his Father, brought Chase to Dover thinking I was going to be bowling on Thursday but little did he know there was a surprise in the works. I had made calls, sent emails etc approx a month in advance and up till a day before to make this happen for Chase. I contacted Trish Kriger of Jeff's Foundation who contacted Jon Edwards, (Jeff's PR man) and we all figured out the date and time. 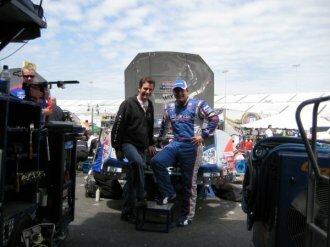 On the other side at the track to get Chase into the pits , Derrick Stanley and Gary Camp were extraordinarily helpful. I can't thank these wonderful people enough ! I also have to thank Allen Bestwick of ESPN for his help with passes ! The voice of Nascar racing !! Jeff was doing an interview and when that was over he came into the office where we all were at and WOW the look on Chase's face was priceless !!! Chase can't talk because of strokes he has suffered but there was no questioning the excitement he was feeling . Jeff was as always with kids fantastic with Chase ! Jeff asked questions and talked to Chase providing him with the most memorable day in his life ! I can't thank Jeff enough for taking the time out of his super busy schedule to do this for Chase. 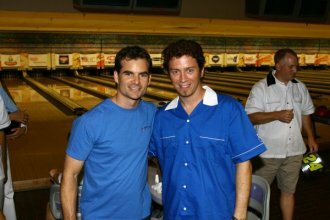 I will be at The Jeff Gordon Foundation's annual Bowling event in Indy in Late July again this year helping out with his event. Last year they raised $250,000 for the Riley Children's hospital in Indy. The weekend of June 20-22nd I went to go see the fastest accelerating cars on the planet. I went to go see my friends Chuck and Del Worsham of CSK race as well as Morgan Lucas and JR Todd of Lucas Oil racing.Del got to the semi finals while Morgan and JR lost first round. 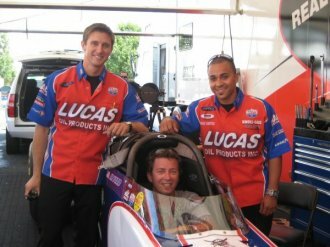 JR let me climb into the cockpit of his 330 mph dragster and it was tight quarters. These guys take in 4-5 g's at the hit of the throttle and up to -5 g's when the parachutes come out at the end of the run. Unreal. It was awesome to see live as tv does no justice.Picture above is Morgan, me and JR. 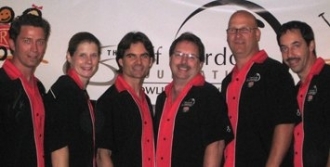 These guys are also avid bowlers and we all bowled the Pro-Am in Columbus earlier this year !!! Click the headline to check out their site. Here pictured with Del and Chuck Worsham. Chuck has the lanes in his race shop in Ca. These guys are avid bowler's. Del made the semi finals and just barely got beat....click on the headline link above to check out Del's site. From May 21st to the 26th I was in Indianapolis for the Indy 500. What a week of walking , taking pics and enjoying one of the most unbelievable events on the planet. Pics will be added soon. The pic above is with Jason Sobush and Brian Goslee (Elvis) . Jason was the turn 3 spotter for the 500 winner Scott Dixon. Jason was the man who hooked up the deal at Target Chip Ganassi racing that aired on the PBA show a few months ago where a few PBA players got a tour of the facility and tried in vain to change an Indy car tire. On Sunday April 6th, Joy Esterson (PBA Ladies series Champion) and I Helped out with a fund raiser at AMF Southdale Lanes for 12 year old Chase Weese who has a inoperable brain tumor. We had a silent auction with Ravens Jerseys, signed Items from Walter Ray Williams Jr,myself ,Joy and Mika Koivuniemi. Nascar items, baseball items, Terps Items and much more. We raised over $5000.00 for the family's medical bills. We also had a beat the pro's in which many tried their luck to get high count per shot against Joy and Myself and a 50/50 raffle. It was 20.00 to bowl for 2 hours and we all had a wonderful time ! Chase and his little brother Cory are avid fans of bowling and watch every show. They are also fans of racing,football and baseball and they bowled for 3 hours straight Sunday !!! What fun they had ! Many friends and family showed up to support this event as well as Betsy Hanson, the Mother of Stephen (see below), Stash from 98 Rock Baltimore (thanks for having me on air Friday afternoon drive time talking about this event ) for coming out as well as Micky,Amelia and Speigel from 98 rock for having me on air on the morning show Tuesday about this event. I also would like to extend my gratitude to Sean Lepper and the Lepper family,Dave Bauer and Cheryl Hyatt of D&S Pro Shop and AMF Southdale Employees for all their help in organizing this Fund raiser.Amy Miller,Maureen Cocca and Dana Iannantuono for running the silent auction and 50/50 's. A HUGE thanks to Rafael Visoso, the Manager of AMF Southdale, for hosting this event for Chase as this would not have been possible without his Center. Thank you for any and all help !!! On Tuesday Feb 19th Chris Loschetter, Ronnie Russell and Jim Tomek Jr and myself visited the facilities of Target-Chip Ganassi Racing In Indianapolis. Thanks to my friend Jason Sobush At TCG for the hospitality of letting us check out their facility. We did a tire change and Jim was the fastest at 8 sec. Ronnie was at 9 sec. I was at 11 and Chris...well had a prob with the lug...(the pro's do it in 6 sec under pressure !). It was a great fun interesting learning experience for us as racing fans ! There will be a small segment on the PBA SHow also on sun feb 24th. Hope you enjoyed watching Mike Fagan and I win the PBA Doubles Event on ESPN. We led the tournament and won on Feb 3rd! I won my 12th title and Mike his 1st. Go to the PBA's link for the final story ! On Thuesday July 26th I along with other PBA Pro's attended the Jeff Gordon Foundation's annual bowling event for the Riley children's Hospital. The event raised over $248,000. As one of the celebritie's in attendance I bowled with NASCAR STAR Jimmie Johnson. Next to me was Allen Bestwick and Dave Burns from ESPN. Also there bowling was Busch series Champion and good friend Stephen Leicht. 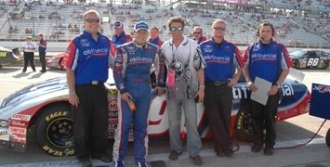 Another friend and IRL driver ,Sam Hornish, was also there in attendence alond with many other drivers.. 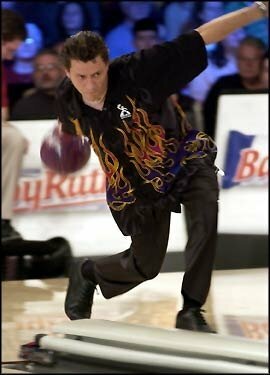 Pro bowler's there were Doug Kent, Parker Bohn III, Kelly Kulick, Mike Aulby. I Took a few days and went to Milwaukee to see the Busch AT&T 250 race at the famed Milwaukee Mile track. Had to go see my friend Stephen Leicht who won the previous week in Kentucky. 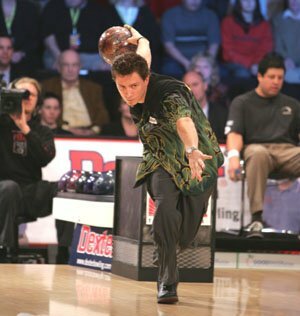 See the story that's up on www.PBA.com and on www.bowl.com. There are some cool picture's of the events that took place. I also must thank JimTretow of the Milwaukee Mile for his hospitality! I actually was on the stage, thanks to Jim, with other celebrities greeting the drivers as they were introduced before the race. Totally off the hook ! Made the show and ended up finishing 3rd ! Really good week for me. Click the link for the full story. Also, more of the Vengeance shirt I wore for this show will be coming in soon. Check the DWGEAR link on the left side of the page. PHOTO CREDIT- PBA LLC.. 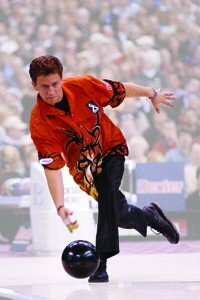 The 2007 PBA skills challenge shows can be found by copying and pasting these links ! If you missed them here is your chance to see how Doug Kent and I did. I was in Indianapolis for the 90th running of the Indy 500 the end of Mayand what a blast. My friend Sam Hornish Jr. won the Indy 500 sniping Marco Andretti at the last second! This photo was taken right in the pits on Carb Day...check the link for the IRL's story. 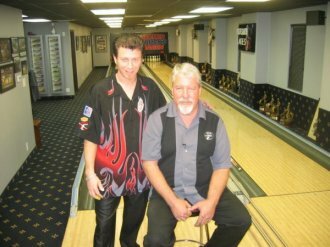 Check out the interview I recently did for the Let's go bowling radio/internet show. Also check their site out in my links section along with a few other of my friends. Here is something to check out on you tube that someone posted. There are some cool bowling clips in there on other events also. This is from the Miller High Life open in 2003. My 10th title! Jack Anderson of the #38 Oasis Bowling Racer sponsored Pro-late model series has decided to use his favorite bowler's website on the his Race car. Driven by another avid bowler Bart Ingram and racing at www.laniernationalspeedway.com in Braselton Ga ,which is 70 miles north of Atlanta. " They asked me if it was cool knowing that I am a race fan ! I couldn't pass this up in hope's that it would help them from my side(website) to obtain more sponsorship" "The amount of people that go to my site will hopefully help them in their pursuit of sponsors.In return just having My logo(website) on the car will attract more race fans into bowling. It will create a little curiosity for both sides plus it's cool as heck to have my website on a car"
Both Jack and Bart are avid bowler's. Jack averaged 221 and Bart is in the low 200's. 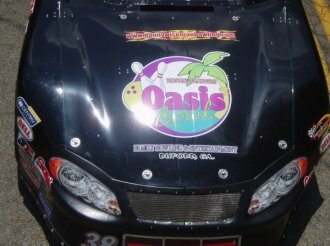 Currently the car is sponsored by Oasis Bowl in Buford Ga. The Thirsty Turtle Bar an Grill our Bar( inside the lanes) and Crawler Equipment Sales in Lawrenceville, GA. They are looking for more sponsorship to keep racing. They recently won an event held at Lanier last week and hope to add more wins in the next few weeks.